A tried-and-true estate planning strategy is to make tax-free gifts to loved ones during life, because it reduces potential estate tax at death. There are many ways to make tax-free gifts, but one of the simplest is to take advantage of the annual gift tax exclusion with direct gifts. Even in a potentially changing estate tax environment, making annual exclusion gifts before year end can still be a good idea. What is the annual exclusion? The 2016 gift tax annual exclusion allows you to give up to $14,000 per recipient tax-free without using up any of your $5.45 million lifetime gift tax exemption. If you and your spouse “split” the gift, you can give $28,000 per recipient. The gifts are also generally excluded from the generation-skipping transfer tax, which typically applies to transfers to grandchildren and others more than one generation below you. The gifted assets are removed from your taxable estate, which can be especially advantageous if you expect them to appreciate. That’s because the future appreciation can also avoid gift and estate taxes. The exclusion is scheduled to remain at $14,000 ($28,000 for split gifts) in 2017. But that’s not a reason to skip making annual exclusion gifts this year. You need to use your 2016 exclusion by Dec. 31 or you’ll lose it. The exclusion doesn’t carry from one year to the next. For example, if you don’t make an annual exclusion gift to your daughter this year, you can’t add $14,000 to your 2017 exclusion to make a $28,000 tax-free gift to her next year. While the President-elect and Republicans in Congress have indicated that they want to repeal the estate tax, it’s uncertain exactly what tax law changes will be passed, since the Republicans don’t have a filibuster-proof majority in the Senate. Plus, in some states there’s a state-level estate tax. So if you have a large estate, making 2016 annual exclusion gifts is generally still well worth considering. 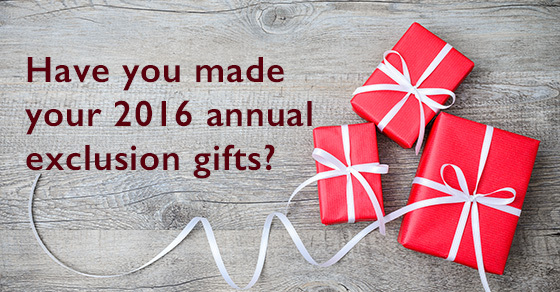 We can help you determine how to make the most of your 2016 gift tax annual exclusion.